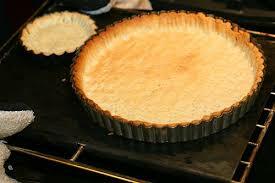 Adrienne gave me Rose Levy Beranbaum’s Pie and Pastry Bible for Christmas one year and afterward I abandoned all other recipes for flaky tart pastry. This recipe takes all the guesswork out of making pastry and, though the process is a bit unusual, it requires no special skill, just a food processor. Step 2 Place the flour mixture in a food processor with the metal blade and process for a few seconds to combine. Do not discard the plastic baggie. Step 3 Add the larger amount of butter to the flour and process for about 20 seconds or until the mixture resembles coarse meal. Add the remaining frozen butter until all the frozen butter is the size of peas. Toss with a fork to see it better. Step 4 Add the 2 ½ tablespoons of ice water and all the cider vinegar and pulse 6 times. Pinch a small amount of the mixture together between your fingers. If it does not hold together, had half the remaining water and pulse 3 times. Try pinching the mixture again. If necessary, add the remaining water, pulsing 3 times to incorporate it. The mixture will be in particles and will not hold together without being pinched. Step 5 Spoon the mixture into the large plastic bag. Holding both ends of the bag open, knead the mixture by alternately pressing it, from the outside of the bag, with the knuckles and heels of your hands until it holds together in one piece and feels slightly stretchy when pulled. It is important that your hands not come in direct contact with the dough at this point because the warmth from your hands will cause the butter to melt a bit and that will impact the flaky structure of the dough. Step 6 Flatten the dough into a disc and refrigerate in the plastic baggie for at least 45 minutes. When you are ready to use it remove from the fridge at least 20-30 minutes before rolling. Step 7 For partially blind cooking, preheat oven to 400 F roll the pastry dough and line your tart pan. Prick the bottom of the pastry with the tines of a fork. Cover with buttered parchment paper and line with ceramic pastry beads or use uncooked beans. Bake for 8-10 minutes. Step 8 *If you live in a very cold climate, or store your flour in the fridge, I find it is not necessary to freeze the flour mixture. If, however, you live in a warmer climate this step is quite necessary.